That Duncan Hunter deer in the headlights look: Get used to it. Hello, Rep. Duncan Hunter (R-50th District). Looks like you got served. Hunter wasn’t playing with Monopoly money, unfortunately, but with $62,000 — that we know of now, it definitely was more — of campaign donor money illegally used for personal expenses. The fact that much of that money came from defense contractors influence peddling this member of the House Armed Services Committee, same as they did with his dear old dad before him, is just lagniappe, or “something given as a bonus or extra gift” in New Orleans parlance. Given the revelation of a federal criminal investigation of Hunter for the same campaign finance violations that got Jesse Jackson Jr. sentenced in 2013 to 30 months in prison, Hunter has a choice to make: Leave office of his own accord or be dragged out, do not pass GO, go directly to federal prison. And his little wife, too. 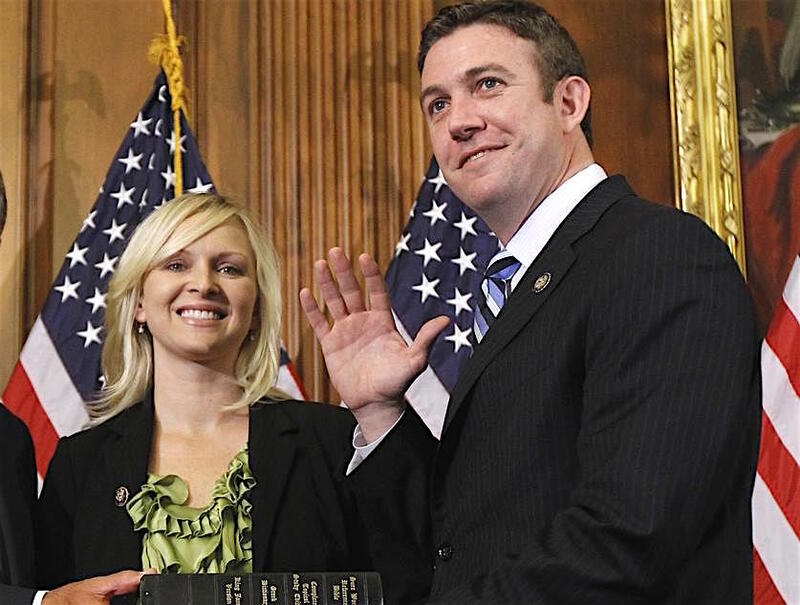 Duncan Hunter with his wife Margaret, presumably swearing to something. Next stop: Federal Court. Yeah, Hunter, and his wife, got confused by the color of the campaign credit and personal credit cards and used the wrong one for at least the year we know about to run up over $62,000 in personal expenses charged to his re-election campaign. Yeah, and we got a Republican health care plan, early Donald Trump endorsement, sarcastic amendment to draft women into the military — he voted against his own bill, it passed anyway — e-cigarettes on airplanes, teardown of high school student art from the US Capitol walls and cigars for military personnel to sell you, too; all part of Hunter’s legacy of malfeasance, misfeasance and incompetence in the last two years of his 8-year reign of hypocrisy and stupidity. As ridiculous and obviously illegal as Hunter’s eight years of office has proved to be, one would think he had at least learned the lesson that spending campaign money on personal expenses was a bad idea. An Escondido Grapevine investigation of Hunter’s last round of Federal Election Commission filings discovered he doubled down on his use of campaign funds for personal expenses in the last six weeks of 2016. He spent $58,062 of his $771,345 campaign fund for 2018 re-election expenses precisely mimicking the ones he admitted to, and repaid, just before the 2016 election. The largest of those expenses was $18,739 paid on Dec. 19, 2016 to Berke Farah LLP for legal services. This Washington D.C. law firm is believed to be defending Hunter now against the criminal investigation for misspending campaign funds announced by the Department of Justice on Thursday, March 23. Talk about draining the swamp as his hypocritical role model Trump said — and of course, his dad, Duncan L. Hunter, was named most corrupt member of Congress in 2007 by the non-partisan watchdog group, Citizens for Responsibility and Ethics in Washington — Hunter needs to pull the plug on his own bathtub of putrid ethical stain. Not that Hunter was doing anything positive for the district or ever represented the hopes and dreams of most of his constituents anyway. Just that his time and energy now will be consumed with defending himself and his wife from DOJ charges. Hunter is not going to escape judgment, although having Trump and Sessions in charge of the DOJ, for now, gives him a fighting chance. And you know, as Hunter right after the 2016 election infamously said, he wanted to restore “a warrior culture, a warrior mentality” to the government, so presumably he may want to go down fighting. He can fight like a cornered raccoon now, but it’s not going to do him any good and he certainly can’t hide, as he did for years behind the facade of one of the most lopsided red seats in California with a 2-1 registered advantage of Republicans over Democrats. Take Jackson Jr. who went down in 2013 as a recent example of what will happen to Hunter now. “On February 8, 2013, Jackson admitted to violating federal campaign law by using campaign funds to make personal purchases. Jackson pleaded guilty on February 20, 2013 to one count of wire and mail fraud.On August 14, 2013, he was sentenced to 30 months in federal prison,” according to Wikipedia. Jackson misused $750,000 in campaign funds for expenditures similar to Hunter’s. Jackson’s wife, Sandi, participated in the scheme and was sentenced to one year in prison for covering up the fraud. In Hunter’s case, his wife Margaret fully participated in his campaign donor fraud scheme with her fingerprints all over the discolored credit cards. She also was his “campaign manager” pulling down over $60,000 in vendor payments in the 2015-2016 election cycle alone — second highest vendor expenditure – along with previous payments over the years. Maybe, the Hunter political crime family will get some kind of sweetheart deal or avoid prison although it’s hard to see how. Granted, Hunter’s dad, one of the most powerful members of Congress during his 26 years there, escaped prison by his chinny chin chin. Hunter, the elder, got off on a technicality during the Bush Administration when he took $40,700 in campaign contributions from Randy “Duke” Cunningham (R-50th District) briber Brent Wilkes. Hunter funneled the money to the injured Marine Semper Fi Fund, so escaped because he supposedly didn’t use the money for personal expenses. Cunningham, who took $1 million from Wilkes, wasn’t so fortunate. On March 3, 2006, U.S. District Judge Larry A. Burns sentenced him to eight years and four months in prison for the scams. Hunter, the younger, apparently wasn’t so savvy as dear old dad. He neglected to give himself cover, and is totally culpable and guilty, as he himself acknowledged through the very act of paying back two-thirds of the original illegally used campaign funds the week before the November 2016 election. Anyone who witnessed Hunter’s unhinged, deranged March 11 town hall saw there was something seriously wrong with this guy, whether it’s a mood disorder or who knows what else. Hunter won’t be able to do any of the work he was sent to Washington to do as the 50th Congressional District’s representative from here on out because he will be consumed with defending his, and his wife’s, financial improprieties. Since Hunter has shown he can’t walk and smoke e-cigarettes or cigars at the same time, he needs to do everyone a favor and step aside. Do it now, do it fast and get the hell out of our lives, you rascal, you. 3 Comments on "Turn Duncan Hunter over, he’s done"
Maybe Melania will babysit, for you, Duncan and Margaret. Seeing as we’re all paying for First Melania’s special ensconcing in the golden tower, she and hubby may wish to return the small favor of your earlier outspoken support for his presidency with the small favor of taking the kids while mom and dad complete their payback to society. Justice IS blind after all, and that’s a major part of what our military “warriors” are fighting and dying for, right? It is so refreshing to have this kind of coverage in city as conservative as Escondido. Job well done! Thank you! 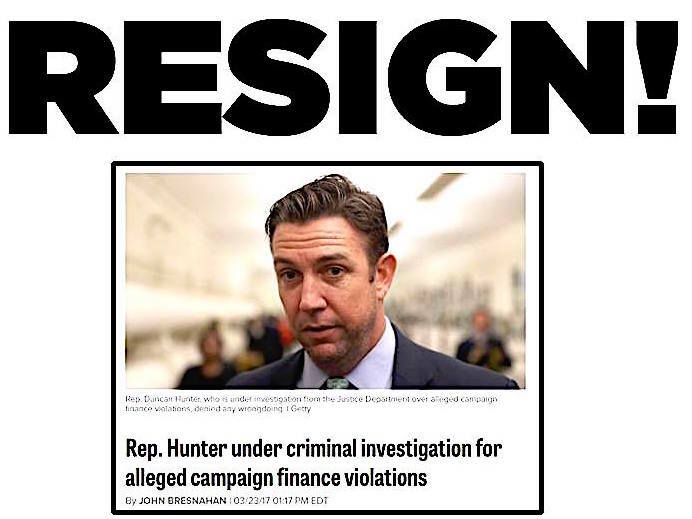 Duncan Hunter is a criminal and should resign immediately! Looks like another Republican crook bites the dust !! !